At Hale Ho’ola, we believe in supporting our local farmers. All products are at least 85% organic and made right here on the Big Island. For example, one of our main suppliers is Ola Hawaiian Body Products, a local company with a reputation for ethical and ecological awareness. These products serve to enhance our many great services, including facials, body treatments, massages, hot stones, and specialty packages. While Lomi lomi is our specialty, other modalities offered include Shiatsu, craniosacral, Thai massage and sports therapeutic work. 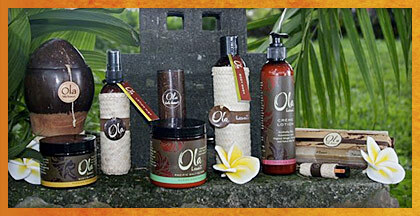 We have a wide variety of spa and body products from Ola Hawaiian Body Products. Pricing and availability is limited to stock on hand. If you're planning on visiting us, we would be more than happy to show you what we have to offer. We do not currently ship any products, or accept online orders. To order Ola Hawaiian Body Products directly, visit their web site.